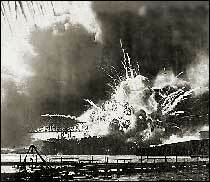 Photo of the explosion of the U.S.S. Shaw, from the National Archives. A strange Pearl Harbor conspiracy site. Here's another one. 1177 souls died aboard the USS Arizona. Here is a list of those killed in the attack on Pearl Harbor, both civilian and military. The attack on Pearl Harbor was a defining moment in America's history. I just wanted to take a moment, and remind y'all it happened today, in 1941. Update: Jim Macdonald has a terrific post and timeline, and quotes FDR's post-attack speech, over at Making Light. The conversation in the comments that follow his post is fascinating and illuminating. I'm glad you posted this, Mac. This day in our history shaped not just our country, but, our world in so many ways. Today's paper had a photo of a local CT guy who survived Pearl Harbor-their numbers are dwindling. I always wondered why the WWII Memorial was the last to be built in Washington when nearly all the vets had passed away. But, it was so necessary to build the one for Korea and Vietnam? Thanks for that reminder, Mac. We are honored in my hometown by having as a resident an 83-year-old survivor of the U.S.S Pennsylvania. He's a wonderful and honorable man. About two years ago, I lived in a house that overlooked the Arizona Memorial from the rim of an extinct volcano crater. I visited the memorial twice, and I don't think I can express how sad it is.